Maker of handmade contemporary bass guitars (made in Melbourne) and teacher of bass guitar lutherie. Find out about the latest builds here. I've been busy finishing off some demo basses for prospective students to try out when they come in to check out our courses! It's one thing to talk with people about what we do but whole lot more to hand them an instrument and say "This is what YOU can make"
So first up is the Jaco. It has an alder body. Nitro paint. Roasted (torrefied) maple neck with a two way truss rod and a few lengths of graphite inside. The fretboard is Macassar ebony that looks a lot like really dark rosewood but has the benefit of being able to stand up to the roundwound strings a little better. The hardware is all Gotoh vintage and the pickups are Fralin split coils with around the 9K output range. I was going to relic this but everyone said a BIG NOOOOOOOOOOOOO! I've helped scores of students create P basses for years now. Literally dozens! 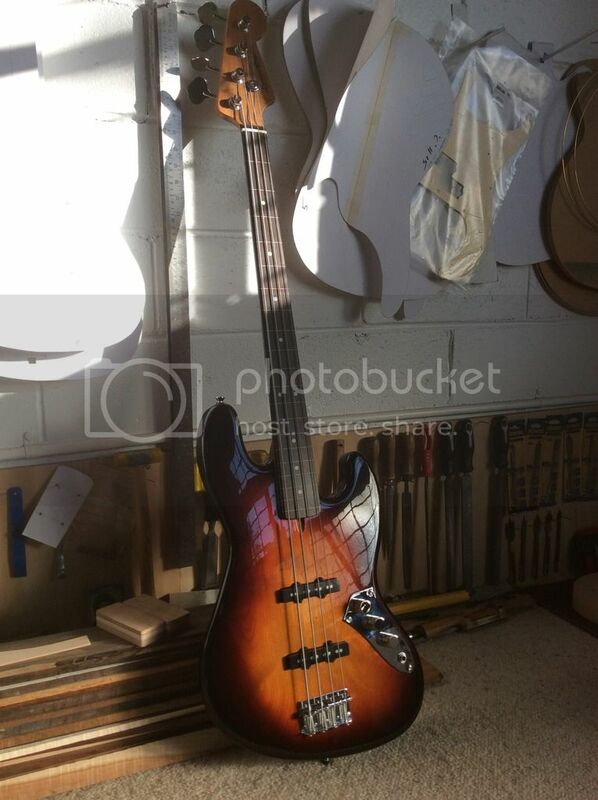 Can you believe it, this is my first ever 'own' P bass build! 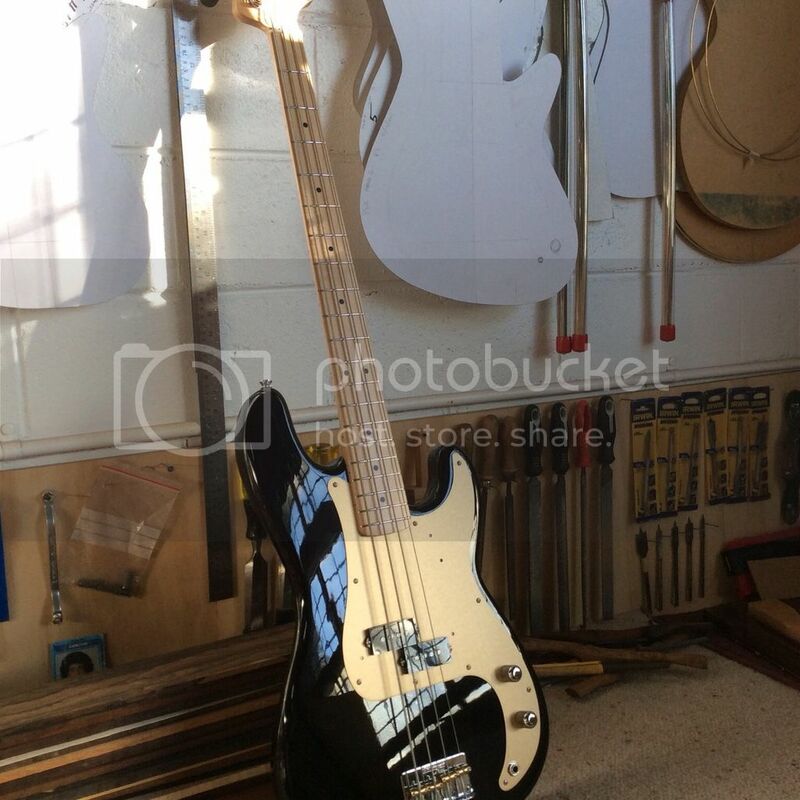 So this one has an alder body finished in black gloss nitro. A gold anodized pickguard. All maple neck with a two way truss rod and a few lengths of graphite inside. 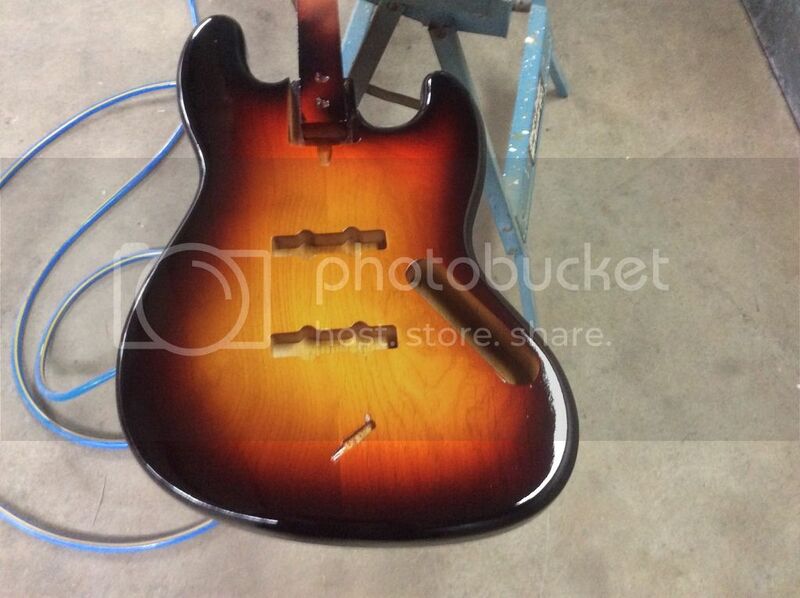 The neck profile is round like a P bass should be. 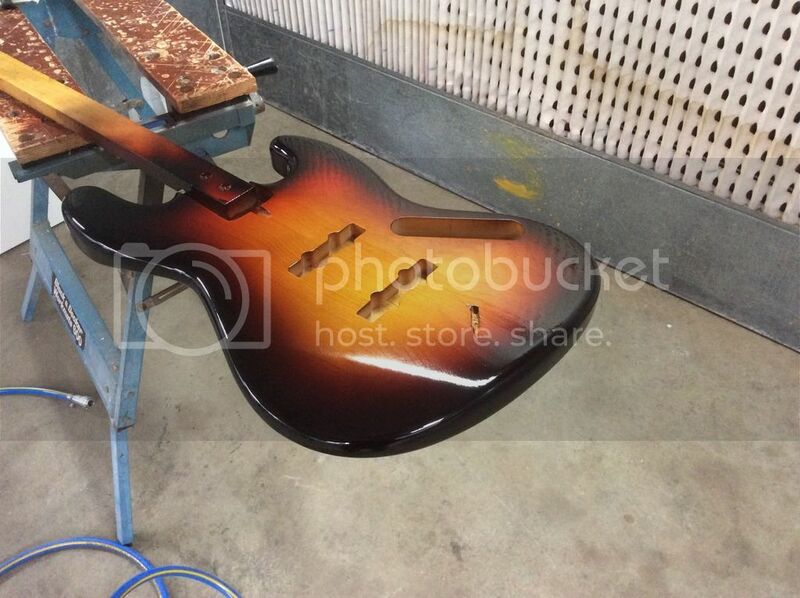 The pickup is a custom built P from Mick Brierley in South Australia. I asked it to have Alnico 5 slugs and wound to 12K! I didn't want wimpy. I wanted BIG. And that's exactly what I've got!! Mick makes great guitar pickups and his work has been revered for decades now, but hasn't pushed into the bass world very much. Come and try this one out and feel the POWER! Please feel free to come and pound my poor old quad-box to pieces with this work of the devil! I bet you could. David is really patient and can show/help you every step of the way. It's about taking your time and having the right tools available to do the job. You'd be surprised at the fixes he was able to make on some of the guys instruments to get them back on track back at NMIT. Ben (16) did Cookie Monster without really having used a screw driver before let alone a bandsaw and router. By the end of the build process he was telling me to disappear as he had it covered. Below all that fur is a body ready to clear coat if needed, no shortcuts taken. Come on, George, we talked (briefly) about this on Saturday. Like Blaine wrote David can provide a lot of guidance along the way to PREVENT any mistakes from happening in the first place. and you have made something tangible. I'd highly recommend you just come to the workshop, have a chat with David and have a look at the builds currently happening. That is lovely - is that the same "look" or style as a mim Classis 50s ? 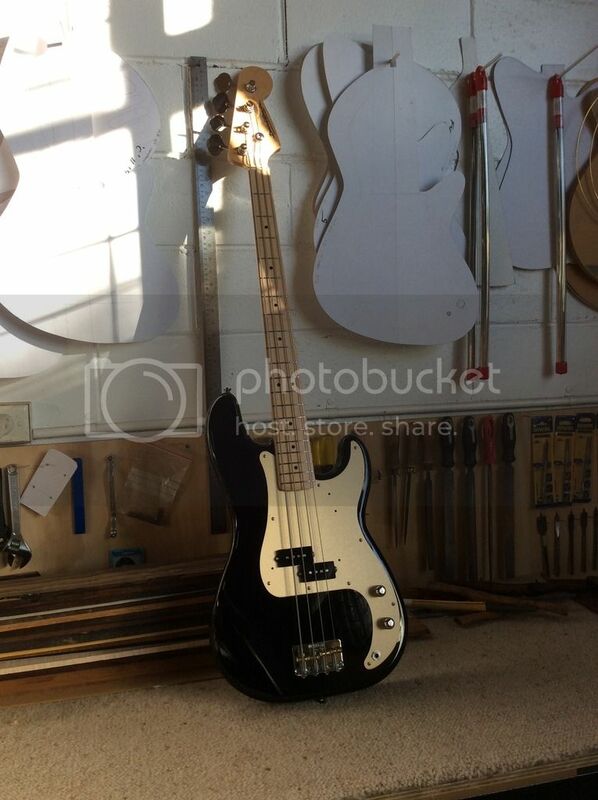 David, how much would a p bass like that retail for? 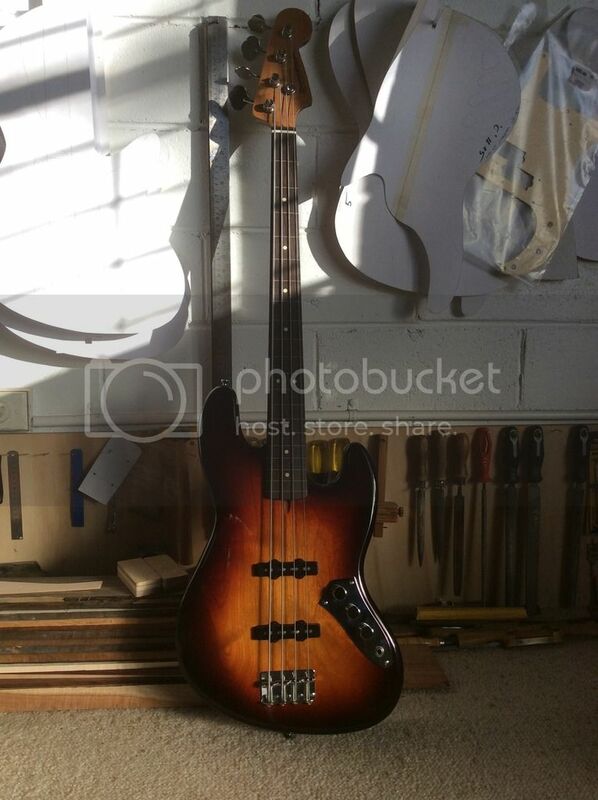 I’ve also let him know you’re asking and the fretless is still available. The P has found a home. I have one of David’s builds and they are top shelf.